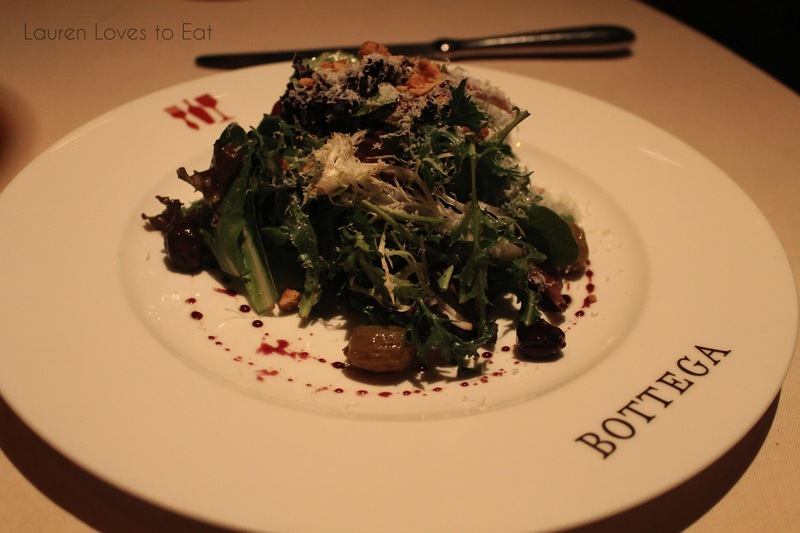 Aside from Bistro Jeanty, another restaurant I had been wanting to try for quite a while was Bottega. As soon as we walked in, I was impressed. 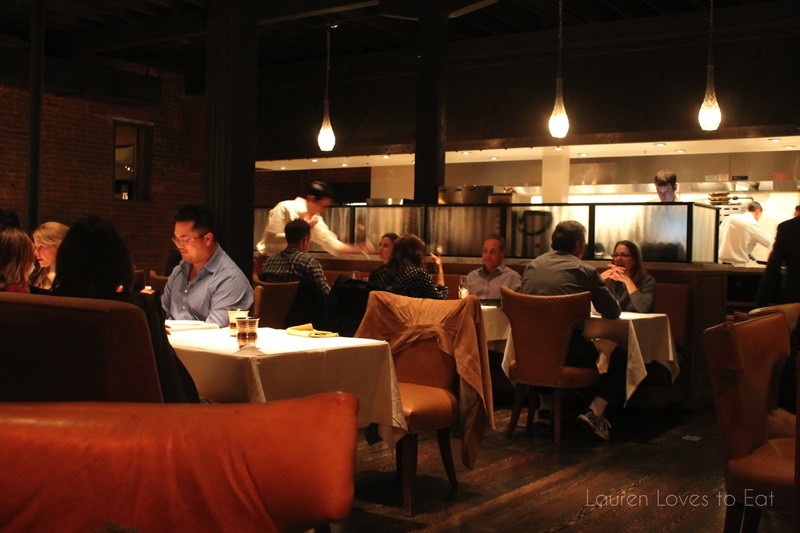 The dining room manages to give off an elegant but non-pretentious atmosphere, and the high ceilings and open kitchen were very inviting. I was excited when we were seated at a round table in the corner of the dining room. 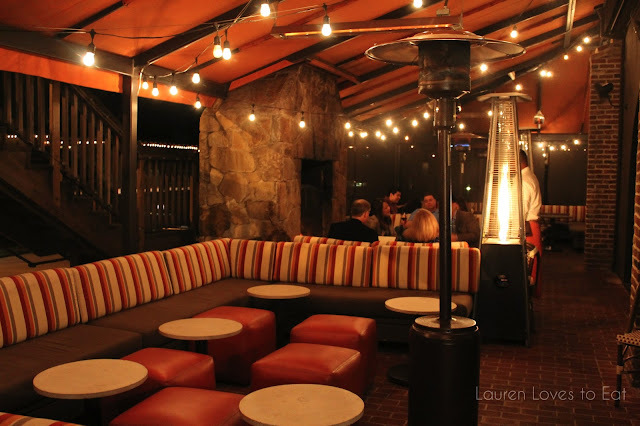 Perfect for people watching and seeing what others had at their tables. The dining room where we were seated. 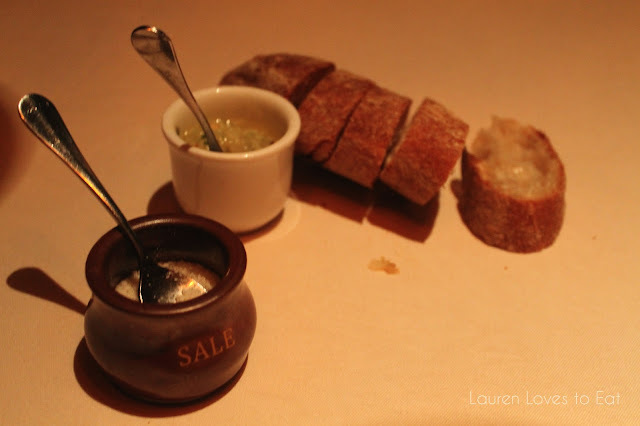 I loved that the ciabatta bread was served directly on the dining table! So rebellious, if you will. On the side, there is a parmesan chili garlic parsley olive oil and a pot of sea salt. Thankfully, the parsley wasn't strong at all. (I despise parsley). Insalata del Uve, $11: Organic greens, verjus vinaigrette, oven-dried grapes, candied hazelnuts, pecorino. A fancier salad with a great balance of citrus and sweet flavors. 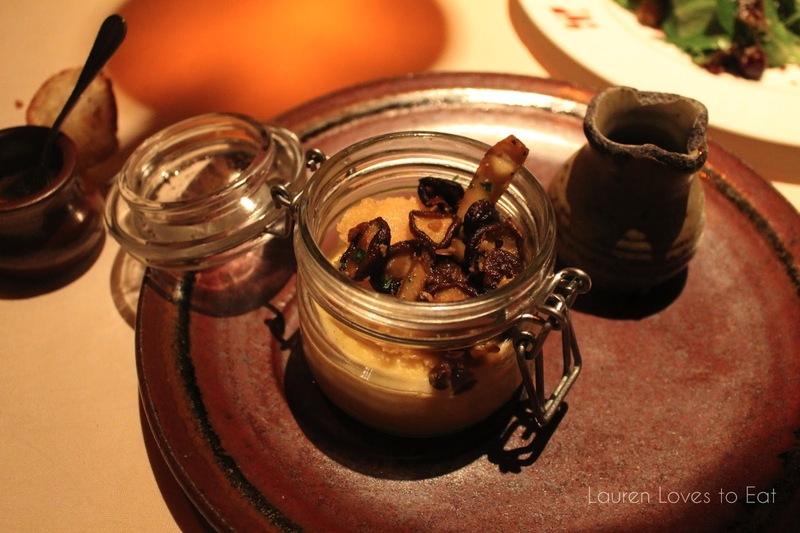 Polenta Under Glass, $12: Caramelized mushrooms and balsamic game sauce. The one dish we had that was really something to write home about and to save me from writing off this dinner as a complete waste of a meal/calories/Napa Valley culinary experience. The silkiest creamy polenta I have ever tasted, with the most flavorful mushrooms sitting atop a layer of parmesan cheese. The combination was heavenly. So delightful, that the side of game sauce veal vinaigrette was altogether unnecessary, although it did bring the dish to even greater heights than I thought possible. 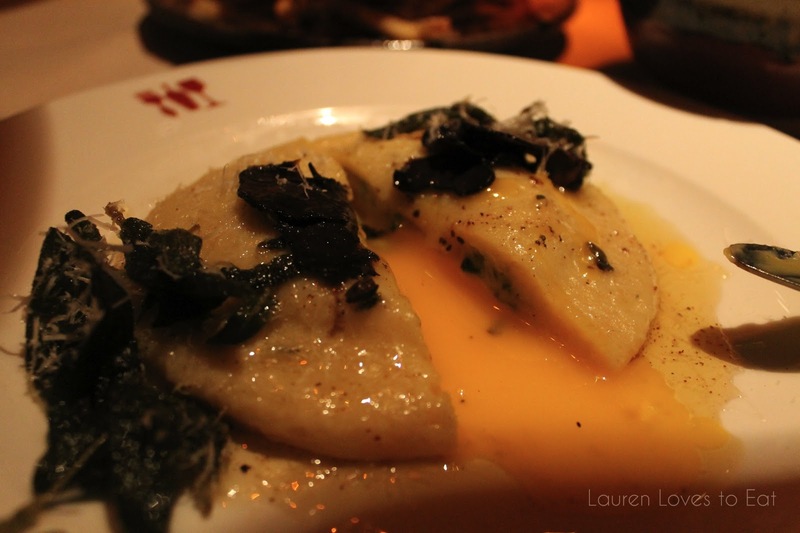 Potato Dough Raviolo, $24: Filled with spinach and ricotta, black truffles, farm fresh egg yolk, sage brown butter. Once I read this menu item, I knew I had to have it (which is really saying a lot, as I am the most indecisive person ever). This sounded so incredible in theory, but in reality was one large disappointment. I am all for potato dough, I even just had gnocchi for dinner tonight, but when it is one large raviolo, that means a whole lot of dense and chewy dough, and not much room for flavor. The egg was fine, and it was great that there were actual shavings of black truffle versus truffle oil, but the dish was still not very interesting. I'm not sure how this could have been improved. Maybe if there was 50% less potato dough raviolo? Or no dough raviolo at all? Either way, a skippable dish. 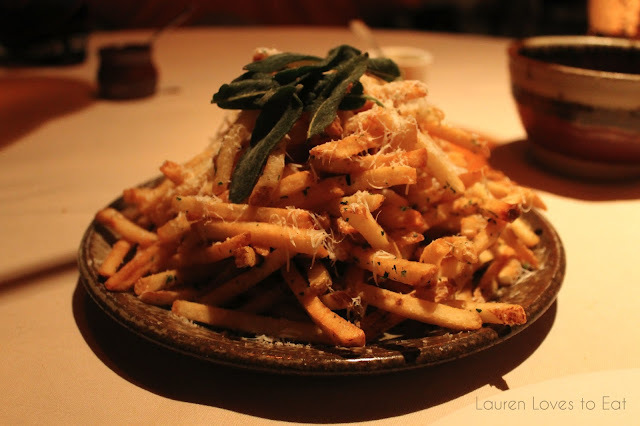 Truffle parmigiano fries: A very generous size for a side order-- these fries were crispy and had hints of rosemary, but very much lacked truffle flavor. 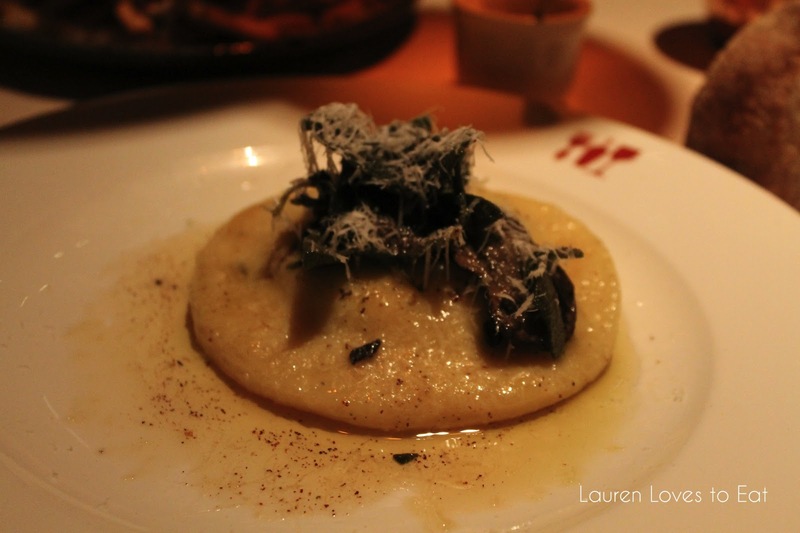 The next day I was telling my cousin how disappointing this meal was, and she told me that she had also ordered the potato raviolo before, and on a second visit to Bottega, forgot how bad it was and ordered it again. I guess the description for that dish really is quite appealing. Be warned! A few weeks later back in NYC, I was at happy hour with a new friend, and when I told her I had recently visited Bottega, she said "omg the dinner I had there was so good I almost cried". 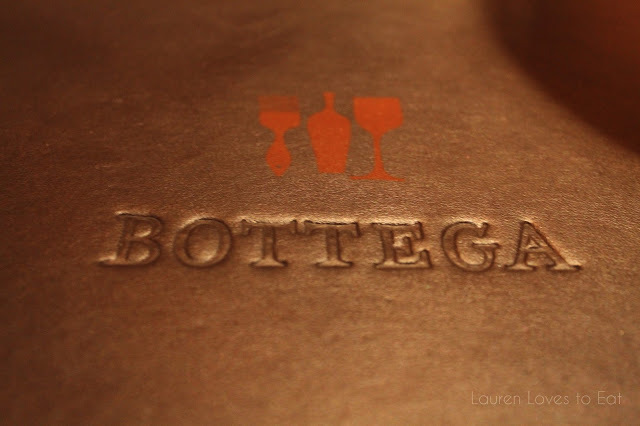 My conclusion is that the next time I'm in Napa for more than 2 days I'll dedicate a meal back to Bottega to see if I missed out on all the respectable dishes. wow.. everything looks spectacular. it's almost lunch time, but i'm drooling here. truffle fries, the polenta with mushrooms! all sounds yummy!!!! btw.. i hope my emails aren't going in your spam.. cuz you said last time you didn't receive it. 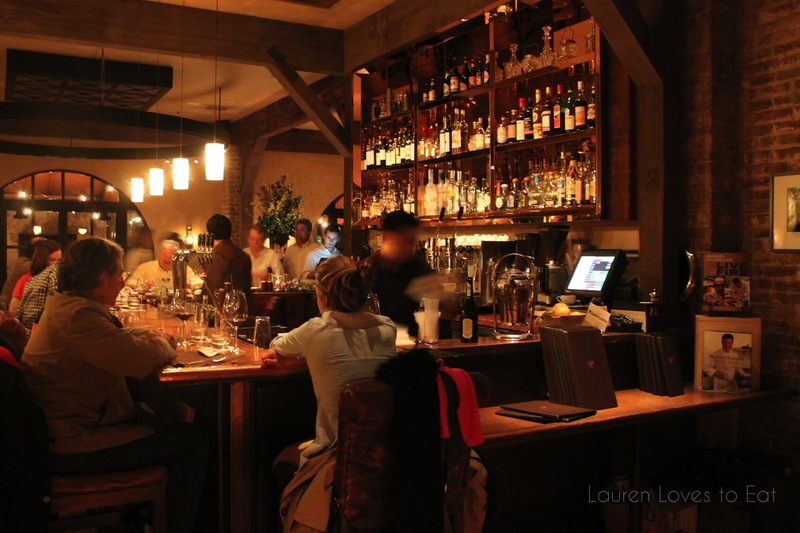 Looks like a great place, the polenta looks super good! haha Thank God for the polenta that saved our meal!